And now on to members in the news…. 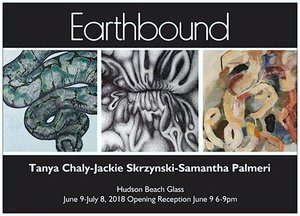 Inspired by a profound relationship with their environment, these three artists interpret the natural world through the lens of science, abstraction and the body. Samantha Palmeri is drawn to nature and the body, seeing intertwining lines and shapes as metaphor for internal struggles. Her studio practice evolves from a process based on repetition, knitting, and braiding. She looks at tree limbs and body parts as much as piles of garbage or laundry. Where it goes from there is left to the unfolding of mood and chance. 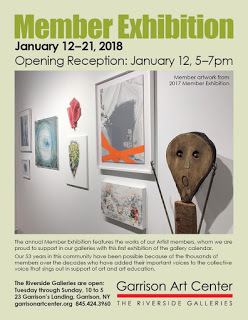 Formerly a gallery owner herself, Palmeri just finished her second successful year as the Director of Beacon Open Studios. Throughout her career, Jackie Skrzynski’s work has challenged physical and psychological boundaries between humans and nature. 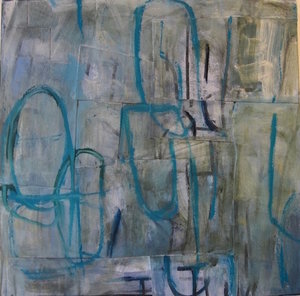 In this work, she collapses the perception of interior and exterior space. 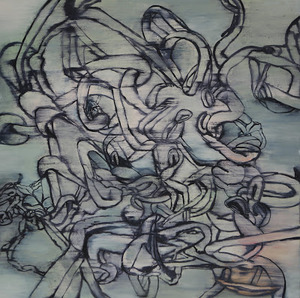 Her large charcoal drawings of swirling forms and tangles suggest similarities between anatomical and botanical forms. Skrzynski writes that her imagery is inspired by her time in the woods near her home. 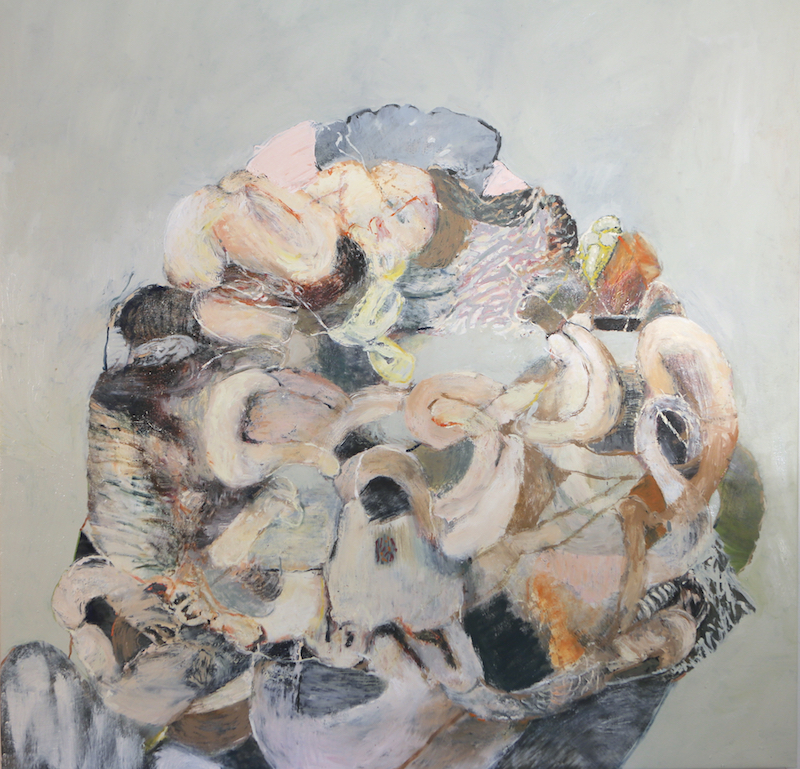 Observing growth, decay and rebirth, she intends to convey her perception of nature as equally beautiful and unsettling. Outside the studio, Skrzynski is the creative force behind P.U.G. 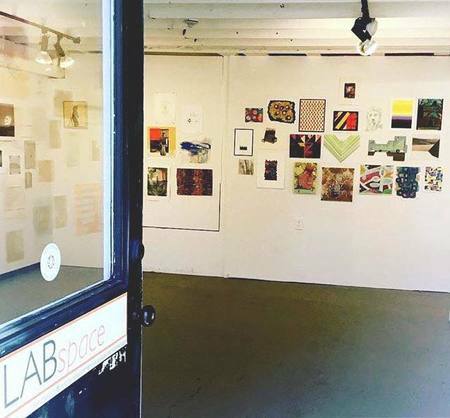 Projects, which stages pop-up exhibitions in Newburgh and beyond. True North is a survey and celebration of upstate NY and surrounding area artists who are connected and engaged at the local level— professionally and socially in real time, IRL. 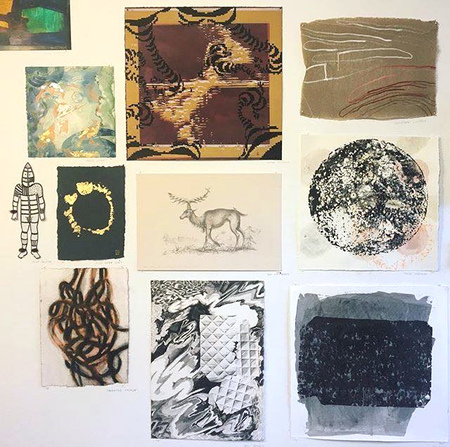 By mapping out this vast visual record of area art makers we hope to strengthen and expand our community, and bring focus to the exciting work being made close to home. 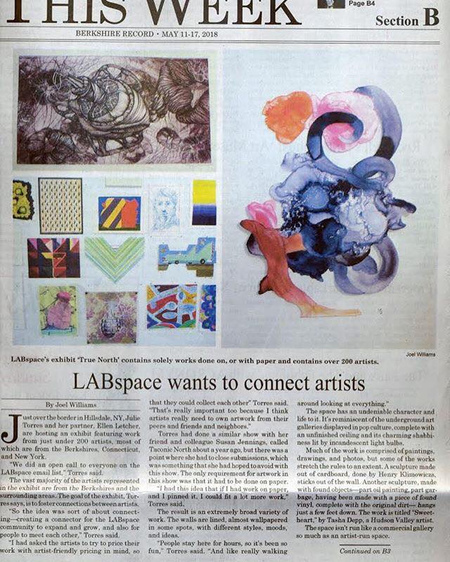 Area artist and curator Julie Torres will wallpaper the walls with small works on paper from nearly 200 area artists, and those who have been active at LABspace via past exhibits and events. All work on view has been selected with artist-friendly pricing in mind. True North is a show about connecting, expanding and transcending physical spaces. 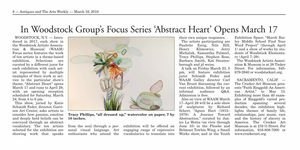 Richard Peck, Richard Saja, Rita MacDonald, Robert Oehl, Roman M.
"Samantha's work is so beautiful but somehow made me feel uneasy. The tangles, the tie-ups, the struggles of life which seem to be expressed in her braided, knotted bundles are represented in such a beautiful palette that none of it seems insurmountable. The bundles are at once those moments of uncertainty wrapped in the comfort of just letting the thing be. Not every tangle with a situation or another being is a bad thing, nor should every knot be undone. Life gets messy and that is okay." 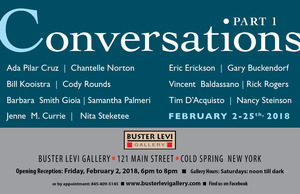 Conversations I is the first of a two exhibits that pair the work of artists whose work or ideas share similar concerns. The ‘conversation’ between the artists in this exhibition is purposefully open and could exist on either content or visual planes or both. 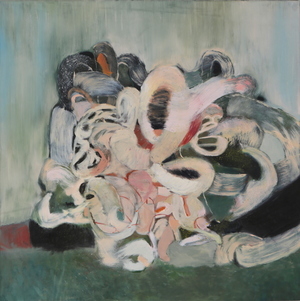 "Palmeri's painting appears to be moving, running, flying off the canvas as she uses a combination of blurred and sharp lines that partially blend into the ground where obvious brushstrokes and scrapings move from left to right."